If you follow me on my blog, you know that this year i've made a definite focus on skincare and prevention. Even though you may not see definite signs of aging and wrinkles, it's still important to have a skin routine to repair your skin now, and prevent future damage. The key is to work now at keeping your skin as young looking as possible. One of the products I definitely recommend is an eye cream. This is the most delicate skin on our face. If you do a lot of makeup looks, we take a toll on this area and it's important to use an eye cream to restore moisture and keep it line free. 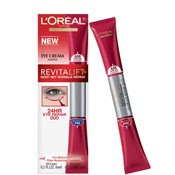 I recently had the opportunity to try out L'Oreal Revitalift Wrinkle Repair Eye Cream. I had heard of this line before but never tried any of the products. Delicate eye skin requires special special care around the clock. Revitalift Deep Set Wrinkle Repair 24HR Eye Duo is L'Oreal's first 24 hour eye treatment. It provides SPF15 protection during the day and fiber-restoring action at night. The formula, made with Pro Retinol A, helps to repair broken skin fibers and smooth out the surface of deep set eye wrinkles. It is clinically proven to visibly reduce the appearance of deep-set wrinkles, leaving you with younger looking eyes. This is a double sided tube, one side for the AM (includes sunscreen) and one for the PM (night repair ingredients). I actually think this is brilliant since a lot of eye creams are pretty heavy, especially during the day time. Also, I love anything that has sunscreen in it! Gotta love the dual use products. I've been using it over the last few weeks and my eye area pretty much looks the same. However, I don't have any deep set wrinkles. It does feel moisturized which is a good base for eye makeup. However, I really don't like the filmy residue it produces. This tends to interfere with eyeshadow application. For that reason I wouldn't buy again. I prefer eye creams that sink into the skin. You can check this product in the skincare aisle of your local drugstore. I use the Oil of Olay ProX Deep Wrinkle Cream. I have been using it for about 5 weeks and they claim you can see a difference in the first two weeks. My followers said they saw a "little" difference. I am soon going to do a followup as I am nearing the end of my tube. I just want to see if it's worth another $50 to continue on ;) But I do have to see I do see a slight improvement. Beats Restylin injections, I suppose. Oh, I should have added that recently I will notice that after I have applied it and allowed it to sink into my skin (for day application), I apply my concealer and notice that little tiny white bits tend to come off. So I'm trying to let a little more time pass before applying my makeup. It does have a nice creamy feel to it. I think the tube looks kinda funny lol.